A week ago, I went to Atlanta to the International Poultry Exposition. It was massive, with an official attendance of over 20, 500 patrons and 895 exhibitors. As a laying hen vet, it is an ideal spot to hook up with researchers, breeding experts, other vets and people who have “been there and done that” since before I was born. I’m willing to bet that if a fact has ever been known about a chicken, someone in that room knew it. Because of the concentration of expertise, it was a great forum for a meeting entitled “The Future of the American Egg Industry”. Although egg farming in Canada is somewhat different, there was a lot that I thought I could learn from the speakers, so I put my quest for loot at the booths, and sat in on some serious stuff. The first speaker was Jeff Simmons, the president of Elanco, the animal health arm of Eli Lily. This guy sits at the head table of a company that in 2008 had revenues of over $20 Billion. He is in a position to know a lot about international agricultural issues. He is also a professional speaker….extremely engaging and REALLY passionate. His message boiled down to the fact that in 50 years, we will need 100% more food to feed the planet. 70% of that increase will need to come from increased efficiencies….we need to produce twice as much food, without using any more water for agriculture. He quoted a UN statement that the most important therapeutic substance for the future will be nutritious food. I have seen references to this in newspapers recently, as well. Mr. Simmons practiced what he preached. He told stories about fasting for 72 hours, then flying into a slum in Rwanda and living on the street for a week. He said that unless you are truly hungry, you cannot appreciate the importance of accessable, affordable food to people in that position in the world. And, according to numbers he used in his presentation, about 60% of people on earth are unsure where their next meal is coming from. And it’s not just in the 3rd world (although mostly). 1 in 5 kids in the US eat 2 meals or less per day (not by choice), 2/5 in England, and 1/7 in France. Without “Food for school” programs, he said that number would be much higher. His opinion is that technology is the key. He is confident that human ingenuity and knowledge will develop ways to improve efficiencies and yields at a pace to keep up with need. Crops that will grow in drier soils, higher yielding strains, disease resistance, faster growing chickens, more efficient laying hens, more milk per acre of grass, more digestible grains, higher starch levels in corn, etc, etc, etc. These improvements will involve all types of science, from genetic modifications, hydrology, microbiology and intensive housing of animals. He feels that there is no alternative to this type of evolution for the vast majority of agriculture on earth. He also discussed his opinion on consumers. He said that 95% of people are food buyers, 4% are lifestyle buyers, and 1% are fringe groups. He describes the groups as this: food buyers are mainly concerned with taste, cost, nutrition and safety. Lifestyle buyers are concerned about specialty qualities ….luxury/gourmet, organic/local, self-grown, etc….he said we are all lifestyle buyers for certain things (think of the premium people pay for THEIR brand of beer, or their Starbucks, or that Ethiopian coffee, even if they buy most of their groceries based on price). The fringe group are a minority who are trying to change the way food is produced. He feels that the difference between lifestyle buyers and fringe is that lifestyle buyers want to INCREASE choice….they don’t care if other people buy “buck-a-beer” brands, as long as there is micro-brew available too…..fringe groups want types of food to be removed from the grocery store, and consumers to have less choice. I found Mr. Simmons to be incredibly engaging, and his ideas are persuasive. I spend quite a bit of time considering opinions of people who want to increase the base cost of food to meet a priority they have….animal welfare concerns, organic production, local food, etc, etc. All of these increase the cost of food…..I was fascinated to hear the “other side of the story” from someone who has a great perspective on world food concerns. I believe that all the concerns are valid, but this talk gives some perspective on the issue. If nothing else, it is something to think about. Today the city of Toronto’s councillors unanimously voted down the chance for backyard chicken producers to debate the issue of legally producing eggs. I am of two minds about this decision. I have met a few of the people in Toronto who are illegally keeping hens already within the city limits, both in person and through this blog. I have yet to meet anyone who I think is doing a less than stellar job in looking after their hens, and they ALL care deeply about the welfare and well-being of their hens. That being said, I understand why the city is hesitant to get involved in the chicken debate. Remember, the bylaws are not really meant for the people who are currently looking after hens….it is to prevent people who start this venture on a whim. If you are motivated enough to skirt the laws to have your hens, you will be motivated to research how to do it, and to give the birds what they need. It’s the “Christmas puppy” syndrome that the laws are meant to guard against…..”hey Martha, the news says we can have chickens in our backyard….could save a couple bucks a week….lets grab some and toss ’em out back, it will be fun!”. These are the folks that will cause odor, noise, pollution and health problems….all of which are risks if the venture is not done well. The councillors did not seem to “get it”. Some of the comments about keeping chickens being “ridiculous”, and that if people wanted a farm experience, they should go to a farm, just showed that they did not appreciate the reasons that backyarders have for keeping hens. There are reasons that henners are willing to go out of their way to build coops, clean up manure, go out of their way to secure good feed, and spend money and time looking after their feathered friends. It’s more than the couple of dollars a week you save in eggs. I guess I’m disappointed that the city wouldn’t take the initiative to make a good law that would allow interested people to keep hens in a healthy, humane way. On the other hand, I’m glad that the city didn’t decide to put together a half-way, slipshod bylaw that would have put human and bird health and welfare at risk. To all the backyarders in Toronto, I would just like to reiterate….the lack of support should not be seen as a criticism of your committment or care….the issue that council faces is bigger than that, and has to be applicable to people less diligent and conscientious than you are…at least the ones I know. Also…the issue has been put off…not killed…the door is still open a crack, and if you can find a way to make council’s job easy enough, maybe they will re-open the file. Good Luck. On Tuesday, I am flying down to Atlanta, Georgia. I am one of 20,000+ attendees from over 100 countries who are gathering to discuss, gawk at, learn about and share ideas on the latest and greatest in the world of poultry farming. If a chicken will ever see, hear, smell, taste, touch or be processed by, it will be on display in Atlanta. The convention center is many football fields in size, and will be filled, shoulder to shoulder with farmers, vets, scientists, salesmen and industry reps who are hoping to discover the cutting edge of egg and chicken farming technology. There is also a scientific program where some of the more obscure points of vet medicine and research will be presented and discussed. I am looking forward to this exchange of knowledge, but I can imagine that most of you would pay good money NOT to attend. Interestingly, this year (similar to last year, but not common before that), a big part of both the displays and the scientific program deals with animal welfare. It is going to be COOL. Getting to talk face to face with the guys who invented the new cage systems, or the better light-bulbs, or the better mouse-traps (It’s true…there ARE better mouse-traps), is an amazing opportunity! Why the plastic at the front of the cage is higher density than the stuff on the side, or why the light-bulb manufacturer spent so much more money on his bulbs so the light contains more of the red spectrum….these things can’t be found in a sales manual, or be explained by the company rep who you have contact with. I think it’s interesting and worth noting how intricate, in-depth, and exhaustive the knowledge about poultry farming is. I’ve been involved in other aspects of agriculture in many capacities, and have heard (or had to say) “I don’t know” when discussing a lot of aspects of livestock farming. There are a lot less grey areas in poultry farming (although still plenty)….partly because so much research is done in the area, partly because of the controlled housing that the birds are kept under, and partly because we collect so much data on each flock. I’m looking forward to my trip (being wined and dined by companies hoping to influence my opinion is not a horrible part of it either), and will post after I get back about anything that I think will be of interest to y’all. Chickens are chickens, and knowledge about professional farms often help with backyard issues too. Actually, the question should be “What is poultry welfare to YOU?”. As I’ve mentioned before, I am doing a Master’s degree in animal welfare. It has long been an interest of mine, and the circumstances resulted in me doing the degree part-time, while I am still doing my vet job. Today, in my “Assessing Animal Welfare” course, a discussion evolved on defining animal welfare (makes sense to figure out what you are assessing before you start). Basically, the gurus say there are 3 broad components of animal welfare – mental states (referred to as feelings or affective states), health (the absence of pain and illness), and ability to live naturally. The great thing is that, almost universally, EVERYONE agrees on benefits and detriments for animals. Nobody will argue that it is good for chickens to be sick, or hungry or in pain; and everyone will agree that it is good for hens to be able to perform natural behaviours like nesting, perching and dust-bathing. It should be simple to go forward from this point. Unfortunately, very few changes in hen care result in improvements in all 3 aspects. 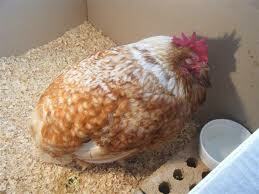 Often, strategies that improve the hens’ health restrict the diversity in the environment, resulting in boredom. More freedom of movement and behaviour almost inevitably result in more injuries and pain. The problems, arguments, plebiscites, lawsuits and angst result from the different emphasis people put on different aspects of welfare. If chickens are allowed to wander outside, they will get more disease, and suffer more deaths and injuries from predators. Nobody will argue this point. What happens is that people argue about whether it is worth it. (Even if, sometimes, the combatants don’t even realize that this is the discussion they are having.) “Hens have to have access to the outside, to feel sunshine on her face”, and “The mortality and disease rates of range housing of laying hens is unsupportable” are actually just different shades of grey. I think that the discussions would be a lot more productive and congenial if everyone involved in the debate would realize that we are all actually on the same side. We all want happy chickens living a free, healthy, productive life. The question is: how many days of illness are worth the feel of sunshine on her beak? How heavy a load of bacteria offsets the satisfaction of scratching through the dirt for bugs and grubs? There is no set answer, but everyone has a valid opinion. The discussion has to continue, and farmers have to continue to evolve to meet the society’s expectations. Just remember, the debate has been going on for thousands of years….Aristotle and Plato discussed animal welfare in ancient Greece. If they couldn’t figure it out, I don’t expect the answer will be very simple or straightforward. I was asked about free run eggs again yesterday. I’ve lost count of how many people I’ve met who are confused as to what the term means. Some people think it means living in a situation like Old McDonald used to have….a few hens, scratching in the yard in the daytime, and trooping obediently into a quaint coop (up a ramp, no less!) for the evening. The farm-wife gathers the dozen eggs or so into her apron before she does the laundry and cooks the meal (Old McDonald wasn’t big on equality). Unfortunately (or, in many ways, fortunately), this is not reality. Remember, you city folks want to be able to grab eggs at your convenience, in whatever store you are closest to. It takes a lot of aprons full of eggs to make that happen. I was in a free run barn a couple of days ago. I took some pictures to show y’all what it looks like inside a professional free-run barn. This is a fairly new barn, run by owners who are VERY diligent and innovative. The barn has a solar powered heat pump gizmo that reduces the amount of propane needed to keep the barn warm, and makes the barn more eco-friendly. The ventilation is designed to minimize electricity usage, and the design and materials are state of the art….as good as anywhere in the world…..at the risk of being labelled a “chicken geek”, this barn is seriously cool. The barn holds more than 15,000 birds. This is about average for a free-run barn, and is near the minimum size that makes things like the heat exchanger, computerized ventilation and modern equipment feasible. The birds have a fair bit of room, plenty of perch space, nest boxes and automatic feeders and waterers. As you can see in the pictures, however, they choose to “flock together” to what seems an extreme amount. 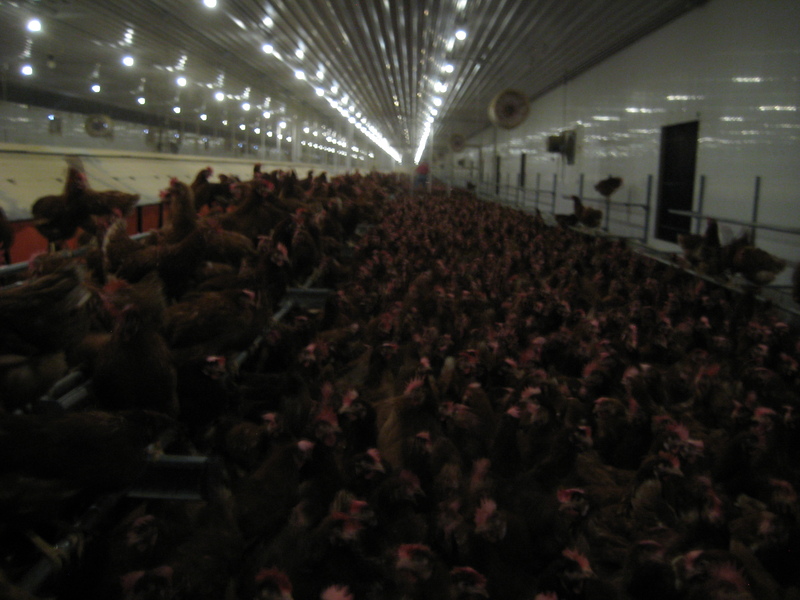 I see it in most of the barns I’m in….there will be a significant amount of empty barn surrounding a clump of chickens….if we housed them at the density they hang out at, we would be in violation of our code of practice, but since they do it by choice, who is to second guess them? There is a conveyor belt under the row of nest boxes, and the eggs are carried to the front by this means, so the farmer doesn’t have to get on his hands and knees to reach in each one to grab the eggs…..it also allows him to keep his apron clean, so it will hold more eggs. I write the title with tongue firmly in cheek. Our winter has been disappointing. At our extended family’s Christmas, one of the cousins’ (I think he’s a cousin) wives (I think they’re married….they have a couple kids) had her family (I think they were related to her…..AARRGGGHHH, Christmas is SO confusing) in from New Zealand. Nice folks, really interesting, but they had never seen snow except on mountains, and were looking forward to Canada in winter. I am embarrassed at how poorly Canada has performed for these valued visitors. Right now, my lawn is pretty green, and there is a tiny snow bank in the corner. Weak. All that aside, it is important for backyarders to “winterize” their flocks if they live in a climate that traditionally has winter. I’ve mentioned this in previous posts about using lightbulbs and bubble wrap or some other form of insulation to keep the hens’ environment above 10 degrees Celsius. Chickens don’t tolerate cold very well, and it is important to try to keep them in their “thermo-neutral” zone if you can. 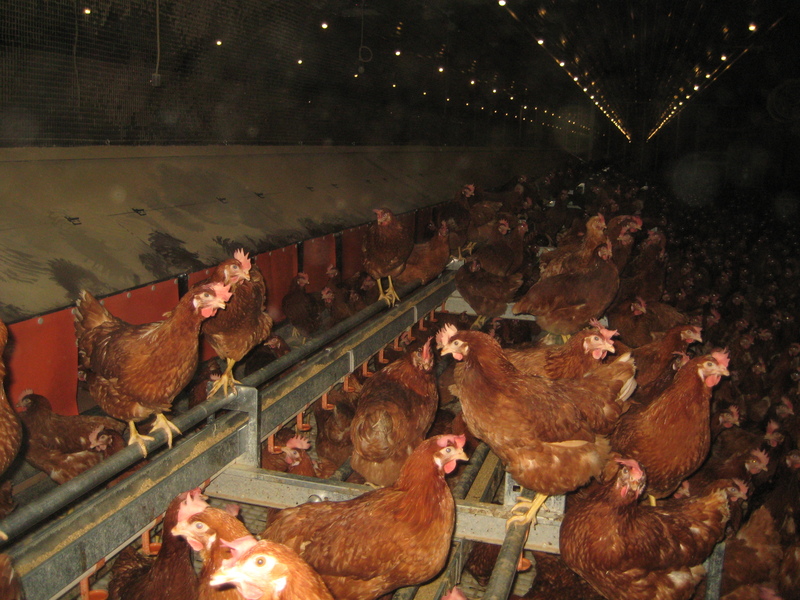 There are other considerations for keeping the environment comfortable for your hens. 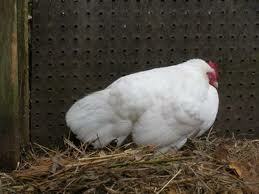 Especially when the coop is “closed down” for the winter, humidity, ammonia and dust can be serious concerns. It is necessary to bring fresh air into the coop for the birds’ comfort and health. Birds staying inside and just breathing will add a lot of moisture to the air, and moisture, along with manure will result in ammonia, which is damaging to the eyes and lungs. In poorly ventilated spaces, I have seen birds develop severe burns to their windpipes and corneas from the acid that results from ammonia. The most convenient way to ventilate your coop is to allow air to escape from the top of the structure, and allow air to enter through the bottom portion of the coop. It is awesome when physics works for you once in a while…..warm air rises, and the air exiting the “chimney” will draw air in through the bottom. This will pull ammonia and carbon dioxide out of the coop, and make the hens more comfortable. Now you will start to face the dilemma that professional farmers face each winter…..how do you balance the need to bring in fresh air with the need to keep the birds warm. If the outside temperature is -20, you can’t bring much fresh air into the coop before you cool them too much. Plus, wherever the cold air enters the coop (or the inlet in a professional barn), physics says that there will be condensation form from the warm air meeting the cold. This results in more moisture in the coop, which means you need to bring in more fresh air, which makes more condensation……fun, huh? The bottom line for the health of the birds is that they can handle being a little cool much better than they can handle high ammonia in the air (read the warning labels on some old type cleaners to see how nasty ammonia is). So, if you have to make a decision between lesser evils, put your head in the coop at the level your chicken’s heads are at, and take a deep breath in through your nose. If tears well up in your eyes, allow more fresh air in, even if it allows the temperature to drop below ideal…..then go to the hardware store and get a higher wattage light bulb, or turn up you heater’s thermostat. I apologize for not being able to give you a “recipe” for providing a good environment for your hens. Your coop is unique, as is your climate and hen’s tolerances. Even in professional barns, which are pre-designed to very direct specifications, the environments are subtly different and need to be “felt out”. I can’t tell you to keep the temperature at 12 degrees and replace the air every 20 minutes…..that is a reasonable place to start, but then you need to watch your hens, and listen to what they tell you….if they huddle under the heat source they are too hot….if they are crowding the walls, with feathers puffed up, they are too cold. If they sit with their eyes squinted shut, and the air hurts your eyes, you need to allow more airflow, regardless of the temperature. Again, if it was easy, I wouldn’t have a job. All the best, and if you have any questions, please don’t hesitate to ask. 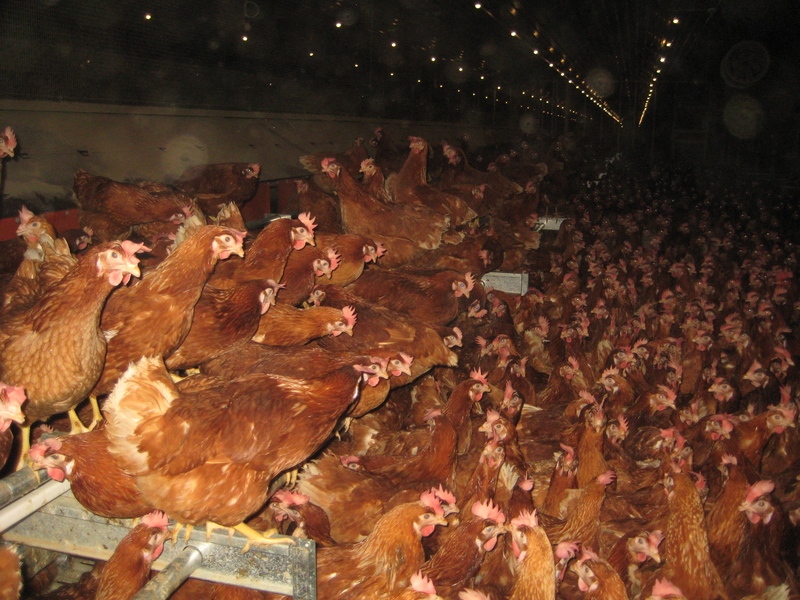 It is the million dollar question….not for chickens, but for all animals. People talk all the time about how animals are, or are not, happy. Animal activist groups demand that animals be allowed to feel happy. Everyone involved with animals (unless they are either a psychopath or sociopath) want their animals to be happy. It ranks right up there with world peace. The question is, how do you know? I spent a semester in an upper level university course, where a very well-respected animal behaviour expert explained to us the latest and greatest findings in the relatively new field of animal ethology (animal behaviour and welfare). Any conclusions made with regards to affective emotions are hotly disputed, even among ethicists. Since the only way to know that people feel pleasure is for them to say so, it is daunting to develop some kind of test for an animal that doesn’t sense the world in the same way we do, and doesn’t communicate in the same ways we do. There is evidence that animals feel pleasure….shown by giving them access to mood altering drugs, and see if they behave the same way they do when we think they are happy. The question remains whether the drugs have the same action on the animal’s brain….but there is evidence that they do. Keeping this uncertainty in mind (how much pleasure animals feel, how do we know? ), there are a lot of measures of contentment. They mostly measure the absence of stuff…..pain, fear, discomfort, stress….things that can be observed or measured. Now….keeping THIS uncertainty in mind (how accurate are our measures, are we measuring enough things, or the right things? ), how do YOU know YOUR hens are happy? There is one more wrinkle to keep in mind….chickens are prey animals. Prey animals are described as “stoic”. Imagine you’re an impala in the African veldt….there is a lion in the grass, and yesterday, you pulled your hamstring. Do you act like a Saturday morning hockey hero?….limping around, holding the affected limb, and telling everyone about the incredible play that caused the heinous injury? Or do you do everything you possibly can to hide the injury? Chickens do the latter….extremely well. “quieter”….”duller”….”down”….or “depressed”. She will sit around a lot, her feathers will often be “puffed up”, and her comb and wattles will look wrinkly and limp. It is important that you know what normal is, since birds on their deathbed will only look a little bit quieter or depressed, especially to the casual observer. If you see one of your charges lazing around, or sitting in a corner when she characteristically wouldn’t be, don’t hesitate to go over to her and check on her….she may never give you much more indication that things are not right. Obvious things should be watched for too….if the hens are all laying on top of each other, they may be cold….if they stop laying eggs, they may have an infection….if they have nasal or ocular discharge, or diarrhea, veterinary examinations may be in order…..if she is limping, she likely has a “lower body injury”…..or maybe she just scored an incredible goal in the Saturday morning chicken hockey game. The most important thing to do, to keep in tune with your flock, is to spend time with them, and get to know them, so you can notice subtle signs….remember, you can’t correct problems you are not aware of.